So this is love?! I am on handbag love overload. Yesterday I brought you a metallic Bronzo true love, the YSL Volcano Tote, which I literally dreamed about, and now I am bringing you the feminine exotic from Marc Jacobs. Marc Jacobs is a man of many wonders. 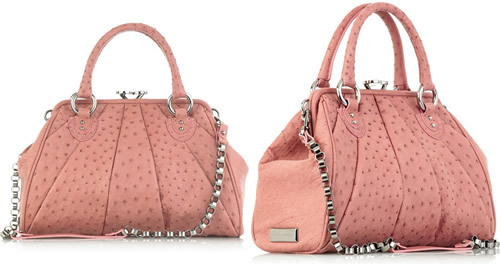 His designs at times are misses, but with the Marc Jacobs Ostrich Stam he found his way into every woman’s heart, with the perfect combination of color, pale pink, and leather, ostrich. I don’t know about you but this bag rocks right to my core, sending me notions of girly wonders that remind me just why I love being a woman. The ability to pair a powerful suit with the perfect feminine accessory is something men must have bag-envy over! Amanda recently covered this rendition of the Stam, labeled the Marc Jacobs Sunburst Stam, and at the time I was not sold on it. It was nice, but it took the exotic skin and color to send me into the world of ohhing and ahhing. The silver tone link chain strap is detachable. I am just all kinds of sold on this. Sold on this and yesterdays YSL bag. My fall handbag list would be complete with these two bags. Buy this Marc Jacobs bag through Net A Porter for $5,500.